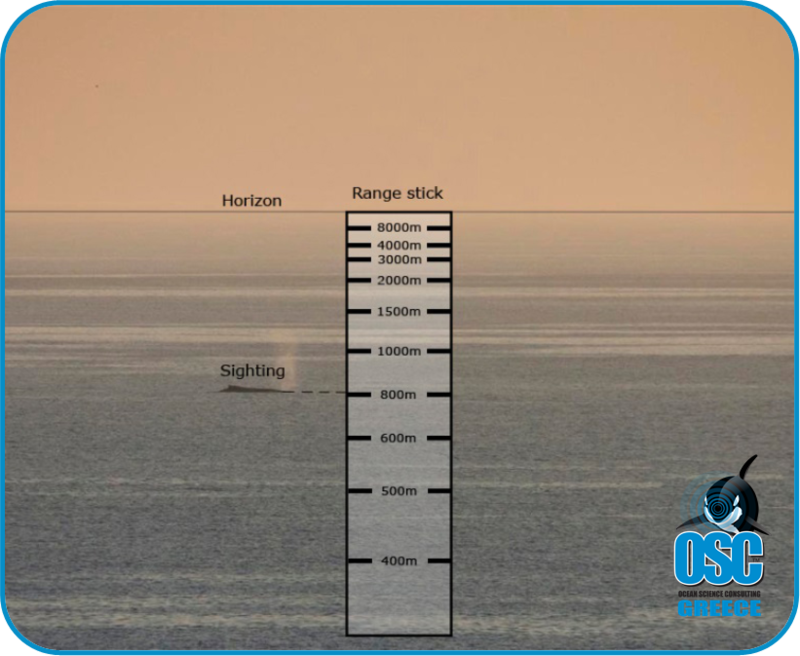 Range sticks are used by some Marine Mammal Observers (MMO) to estimate range to a sighting. This guide details how to make and use a range stick. Out stretched arm length to eye. To make a range stick, horizontal lines, which correspond to ranges, are marked onto the wooden stick (see example below). The position of the lines is determined using a range stick program, which can be downloaded (in English) here. Firstly, calculate your eye height above sea level by adding eye height and observation platform height, and then enter it into the range stick program, along with arm length. Values, which are calculated automatically, specify the distance in cm from the top of the stick to where you should draw a horizontal line. Always remember to write corresponding range next to the line. Holding it in your outstretched arm, align the top of the range stick with the horizon, and read off the range that aligns with the target.